The former Catholic diocese of Narbonne existed from early Christian times until the French Revolution. It was an archdiocese, with its see at Narbonne, from the year 445, and its influence ran over much of south-western France and into Catalonia. During the French Revolution, under the Civil Constitution of the Clergy, the diocese of Narbonne was combined with the dioceses of Carcassone, Alet, Saint-Papoul and Mirepoix into the new Diocese of the Aude, with its seat at Narbonne. It included 565 parishes. It was a part of the Métropole du Sud, which included ten départements. The territory of the former diocese of Narbonne was merged under the Concordat of 1801 into the diocese of Carcassonne. After the Restoration of the Bourbons following Napoleon's defeat at Waterloo, an attempt was made to re-establish the see was defeated in the French Parliament (1817). After nearly a century, a new metropolitan see was created for the Languedoc region, with the elevation of the bishopric of Montpellier to the rank of Metropolitan Archbishop on 8 December 2002. 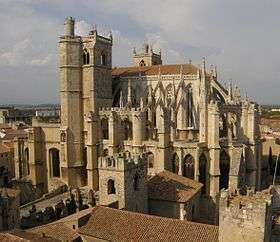 The diocese of Carcassonne was transferred from the metropolitanate of Toulouse to that of Montpellier, and on 14 June 2006 the name of the diocese of Carcassonne was changed to the Diocese of Carcassonne and Narbonne. Toulouse no longer carries the title Toulouse-Narbonne. ↑ "Archdiocese of Narbonne". Catholic-Hierarchy.org. David M. Cheney. Retrieved 21 January 2015. ↑ Paul Pisani (1907). Répertoire biographique de l'épiscopat constitutionnel (1791-1802). (in French). Paris: A. Picard et fils. pp. 361, 371. ↑ David M. Cheney, Catholic-Hierarchy: Diocese of Carcassonne et Narbonne. Retrieved: 2016-07-27. ↑ David M. Cheney, Catholic-Hierarchy: Archdiocese of Montpellier (-Lodève-Béziers-Agde-Saint-Pons-de-Thomières). Retrieved: 2016-07-27. ↑ Gregory of Tours, I. 53, placed Paul in the mid-third century. In the 9th century, however, he was considered a disciple sent by Saint Paul from Rome in the mid-first century. Duchesne, pp. 301-301. There is no authentic evidence of his existence. ↑ Étienne is ignored by Duchesne. ↑ Gavidius is ignored by Duchesne. ↑ Hilarius is mentioned in papal letters dated 417, 419 and 422: P. Jaffe, Regesta pontificum Romanorum I editio altera (1885) nos. 332, 349, and 362. ↑ Duchesne, p. 303, no. 3. Rusticus' episcopate began on 9 October 427 and lasted some thirty years. ↑ Bishop Rusticus attempted to arrange his own successor, and wrote to Pope Leo I recommending Hermes. On his death Hermes assumed the episcopal seat, but was denounced to the Pope by Frederick, the brother of the Visigothic King Theoderic, and by the people as intrusive. Gallia christiana VI, 10-11. ↑ Caprarius was a bishop at the Council of Agde in 506, but there is no proof that he was Bishop of Narbonne: Gallia christiana VI, p. 11. ↑ Aquilinus is rejected as a Bishop of Narbonne by Duchesne, p. 304 n. 2. ↑ According to Duchesne, p. 305, no. 13, he was deposed by the Council of Thionville in 835. Pope Sergius II (A.D. 844-847) was asked to restore him, but refused, and ordered that he take communion with the laity, not the clergy: L. Duchesne (ed.) Le Liber Pontificalis Tome II (Paris 1892), p. 90. ↑ Duchesne warns that his biography is filled with falsehoods. ↑ Archbishop Arnustus was assassinated in 912. Duchesne, p. 306. Gallia christiana VI, p. 24. de Vic, Claude; Vaissete, Jean Joseph (1733). Histoire générale du Languedoc, avec des notes et les pièces justificatives... (in French). Tome second. Paris: Jacques Vincent. p. 47. ↑ Gerard was illegally elected by the clergy and people of Narbonne, before the bishops of the province could assemble for a proper canonical election. Gerard was expelled. Gallia christiana VI, pp. 24-25. ↑ Son of Wilfred II of Cerdanya. His father bought the archbishopric for his son from Vicomte Raimond for the sum of 100,000 gold sols. Guifred was consecrated, although he was only twelve or thirteen years old. Devic and Vaissete, IV, p. 247. ↑ Pierre Berengar was anathematized by the Papal Legate at the Council of Toulouse in 1179, and excommunicated by Pope Gregory VII in the Council of Rome in March of 1180. Gallia christiana VI, p. 39. Philipp Jaffé, Regesta Pontificum Romanorum I (Leipzig 1885), p. 634. ↑ Gallia christiana VI, pp. 319-322: bajulo Domini Bernardi Narbonensis archiepiscopi, qui tenet curam Biterrensis episcopatus ex indulgentia domini Papae. ↑ Laurent, Paul (1886). Livre vert de l'archevêché de Narbonne (in French and Latin). Paris: Picard. pp. i–xii. ↑ Conzié was also Chamberlain of the Holy Roman Church, 1383-1431. He had attended Benedict XIII's Council of Perpignan in 1408, and also the Council of Pisa in 1409. Leonce Celier (1906), "Sur quelques opuscules du camerlingue François de Conzié," Mélanges d'archéologie et d'histoire (in French). 26. École franca̧ise de Rome. 1906. , 91-108. ↑ Eubel, II, p. 85. There was a successor in the Patriarchate on 24 August 1453. ↑ De Vic and Vaissete, IV, p. 255. ↑ Named Archbishop at the age of 19, and Cardinal at the age of 21 (12 December 1583): Eubel, III, p. 47. He resigned Narbonne upon his appointment as Archbishop of Toulouse, on 4 November 1588: Eubel, III, p. 315. ↑ Eubel, III, p. 253 and n. 15. Cf. Goiffin, Étienne Marthe (Abbe) (1877). "Catalogue analytique des évêques de Nîmes". Bulletin du Comité de l'art chrétien (Diocèse de Nîmes). 1: 304–373, at p. 355–356. He continued to function as Bishop of Nîmes. Nomination to a bishopric in France came from the King, by virtue of the Concordat of 1516, but Henri III and Henri of Navarre had been excommunicated, and the War between the League and the two Henris was in progress. Paris fell to the League on 12 May, but the leaders of the League, the Duke of Guise and the Cardinal de Lorraine, were assassinated on 23 and 24 December 1588 on the King's orders. A cautious churchman would hesitate to accept any appointment in 1588. K. Cameron (1974) "Henri III - the anti-christian king," Journal of European Studies 4, 152-163. ↑ He had been Coadjutor of Archbishop Louis de Vervins and titular Archbishop of Heraclea, from 1622. Marguerite Sol (1891). Claude de Rebé: Archevêque de Narbonne, Président des Etats de Languedoc (in French). Paris: Champion. Laurent, Paul (1886). Livre vert de l'archevêché de Narbonne (in French and Latin). Paris: Picard. pp. xii–xiii. ↑ After the death of Cardinal Mazarin (1661), the fall of François Fouquet's brother Nicolas, and the taking of personal power by Louis XIV, the Archbishop of Narbonne was sent into internal exile at Alençon in 1661, never to return. His brother Louis, Bishop of Agde, suffered a similar fate. Joseph Bergin (2004). Crown, Church, and Episcopate Under Louis XIV. New Haven CT USA: Yale University Press. pp. 198–199. ISBN 978-0-300-10356-4. ↑ Besaucèle had been Dean of the Chapter of Carcassone before the Revolution. He was consecrated at Toulouse by Archbishop Antoine-Pascal-Hyacinthe Sermet of the Haute-Garonne on 15 May 1791. He was 78 years old. Paul Pisani (1907). Répertoire biographique de l'épiscopat constitutionnel (1791-1802). (in French). Paris: A. Picard et fils. pp. 371–374 and 457. Eubel, Conradus (ed.) (1913). Hierarchia catholica, Tomus 1 (second ed.). Münster: Libreria Regensbergiana. (in Latin) pp. 356. Eubel, Conradus (ed.) (1914). Hierarchia catholica, Tomus 2 (second ed.). Münster: Libreria Regensbergiana. (in Latin) p. 199. Eubel, Conradus (ed. ); Gulik, Guilelmus (1923). Hierarchia catholica, Tomus 3 (second ed.). Münster: Libreria Regensbergiana. p. 253. Gauchat, Patritius (Patrice) (1935). Hierarchia catholica IV (1592-1667). Münster: Libraria Regensbergiana. Retrieved 2016-07-06. pp. 252. Ritzler, Remigius; Sefrin, Pirminus (1952). Hierarchia catholica medii et recentis aevi V (1667-1730). Patavii: Messagero di S. Antonio. Retrieved 2016-07-06. pp. 280. Ritzler, Remigius; Sefrin, Pirminus (1958). Hierarchia catholica medii et recentis aevi VI (1730-1799). Patavii: Messagero di S. Antonio. Retrieved 2016-07-06. p. 301. Sainte-Marthe, Denis de; Hauréau, Barthélemy (1739). Gallia Christiana: In Provincias Ecclesiasticas Distributa, De provincia Narbonensi (in Latin). Tomus sextus (VI). Paris: Typographia Regia. pp. 1–222, Instrumenta, 1–72. De Vic, Cl. ; Vaissete, J. (1876). Histoire generale de Languedoc (in French). Tome IV. Toulouse: Edouard Privat. pp. 243–260. [Archbishops of Narbonne]. Duchesne, Louis (1907). Fastes épiscopaux de l'ancienne Gaule: I. Provinces du Sud-Est. Paris: Fontemoing. second edition (in French) pp. 300–306. Mortet, Victor (1899). Notes historiques et archéologiques sur la cathédrale: le cloitre et le palais archiépiscopal de Narbonne 13e-16e siècles (in French). Toulouse: E. Privat.